The news has got around by now the the Alajmo brothers of Le Calandre fame have taken the one-and-only Ristorante Quadri* under their wing — and, as is their habit, they are aiming for the sky. Most know the famosissimo Quadri for the caffè; others have dined at the historic, classic restaurant upstairs, the only one on Piazza. The old girl has gotten quite a lift since Max (the youngest chef ever to receive three stars from Michelin) and Raf set up shop earlier this year, and deservedly so. Some things haven’t changed. The massive Murano chandelier still illuminates intricate ironwork and red brocade tufted walls; in the evening, light shimmers through Roman shades draped over wide windows perched above the Piazza. But look closer: the new drapes are a dramatic gauzy black, classic linen tablecloths are knotted around and underneath to expose gracefully carved pedestals; gotò inspired glassware freshens elegant place settings as do transparent red bread dishes in the form of a painter’s palette, testament that chef Massimiliano’s artistry extends beyond the kitchen; you’ll discover it in almost every aspect of the restaurants’ decor, design, and artwork. That is precisely what inspired the 12 courses we were served that warm summer’s day at the Quadri. The LuceFluida menu coincides with the Biennale; Le Calandre and the Quadri each serve a different versions through November 27. You could even consider them collateral exhibitions. The intention, according to Massimiliano, “is to bring the concept of light to food;” he calls it an edible art event, and so it is. That little red palette bread dish might as well have been loaded with textures and tastes from mostardo to mousse, from creamy to crunchy croccante, from delicate to hearty, peppery to sweet to spicy to positively explosive. You don’t have much trouble imagining the kitchen as artist studio, with the cooks working along side Executive Chef Silvio Giavedoni whisking and swiping and searing and dotting to create each portata effortlessly and expertly, swept out just at right moment to present to the delighted guest. Of course there is a traditional menu as well as two other tasting menus; don’t expect the Alajmo team to contain themselves there either, Biennale or no. Suffice it to say the the meal is extraordinary, right down to the wine pairings which open with the Reims Vieille France Champagne to the Anselmi passito for dessert. A meal at the Quadri is an airy, yet intensely memorable celebration of abbinamento, the deft combining of all aspects of the dining experience, in an ambience unique in all the world. Squisito. *One footnote: the restoration/renovation of the Grancaffè downstairs is underway as we speak. Look for news on that soon. This entry was posted in Consuming Venice, Eating Venice and tagged dining, restaurants, travel, venice on September 24, 2011 by Living Venice. 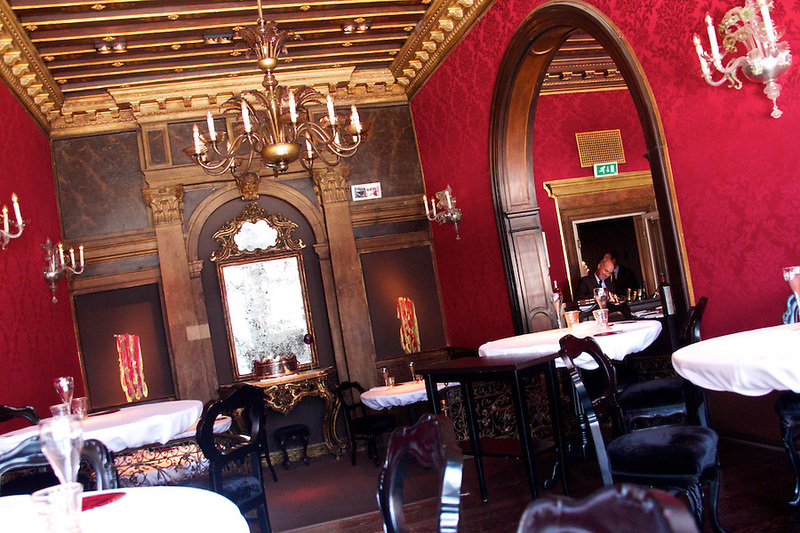 from the upcoming Eating Venice iPhone & iPad app — stay tuned! This entry was posted in Consuming Venice, Eating Venice, Imagining Venice, Vita Venexiàn and tagged fins, fish, pesce, tuna, yellow on September 10, 2011 by Living Venice. Venice means fish…but which is which? 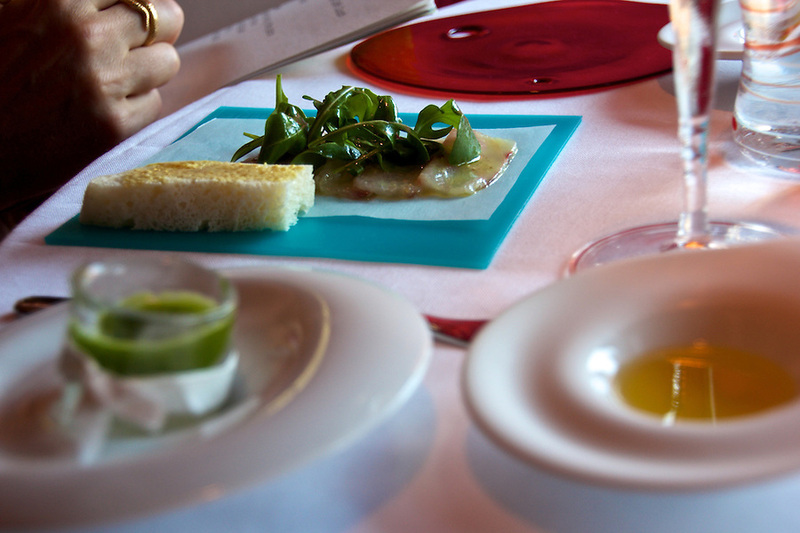 Almost every travel guide will rightly advise you that for dining in Venice, don’t skip the fish. It’s good advice, and perhaps you’re coastal and are already familiar with the myriad of shapes and sizes seafood comes in: crustaceans, mollusks, and regular fish that range from pinky- to thigh-size. 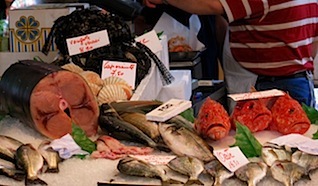 But if you’re a landlubber or are simply more familiar with freshwater fish, I thought I’d run a series of short posts focusing on the fish and seafood waiting for you both on the menus in Venice and in the Rialto Market should you care to visit them before you consume them. The first don’t-miss fish is a crustacean that has an official name of Pannocchia, but that is referred to in Venice as the canocia (in Rome and Tuscany, cicala di mare). The English nickname is Mantis Shrimp, referring to both its front appendages and the sweetness of its meat. These canoce are from the high Adriatic, and so are generally smaller in size that those you might find fished from larger seas. In fact, all fish from this area are scaled to the Adriatic’s size. And according to some pescivendolo (fishmongers) are sweeter as a result. I’m staying out of that argument, however. At the market, all the canoce‘s undersea defenses are easily identifiable: the fake eyes on the tail, the front legs poised to strike, and a shell that’s pointy from stem to stearn. So, if they’re indeed in season, don’t let your unfamiliarity with the canoce‘s looks or name stop you from ordering these tasty morsels…you’ve come too far for that! This entry was posted in Consuming Venice, Eating Venice and tagged canoce, eating in Venice, fish, menu, pesce, venice on October 21, 2009 by Living Venice. This entry was posted in Consuming Venice, Eating Venice, Imagining Venice on May 25, 2009 by Living Venice.